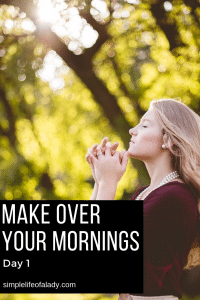 Can you really make over your mornings and change it from chaotic to stress-free? I was inspired by this 100-Day Challenge that I learned from an email that I signed up to. What do you want to happen this 100 days before the year closes so that you’ll finish strong? One of my answers is, I want to have a morning routine that works for me, a routine designed for success. It’s because my mornings don’t look good right now. I normally wake up at 6 am. This may sound early to you already, but for me, I know I can still wake up earlier. I also feel like I’m just going through the motions of the day. I wake up. Then things happen and I just go through them, chores and everything, but not really doing the things that I feel like I should be doing. Let me be more specific with that. I want to be able to really pray in the morning and read at least one chapter of the Bible before I begin doing everything else. Then I want to be able to tend to my plants and feed our animals. We have dogs, chicken, rabbits and ducks. I also want to help my Mom prepare breakfast. And I want to take a bath before I start helping in our eatery business and work on this blog. Perhaps this is a lot to fit into my mornings. Maybe I’m just so strict with myself. Or maybe, I’m just wasting a lot of prime time because I often check my phone and play with it in the morning. I also don’t have a concrete plan for the day. I haven’t been writing to-do lists for the past few months. 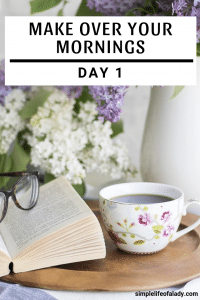 So I want to know how am I going to transform my mornings and end up with a routine that works for me – starting from waking up to being ready to help into our business and jump into my blog. This is why I finally signed up to Make Over Your Mornings by Crystal Paine. 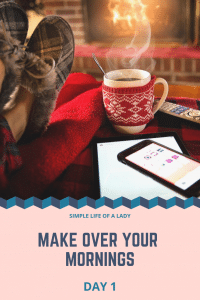 It’s a 14-day online course to guide you in transforming your mornings from passive and chaotic to productive and stress-free. I have read good reviews about it but I haven’t really took the course before because I thought I didn’t need it. Hah… I thought I’ve got everything under control. Now I know how wrong I was and how much I need it. At Day 1, one of the tasks is to commit to a time when you would go over the course everyday. It doesn’t need much time. Just 15 minutes everyday, for 14 days. I picked 4:15 to 4:30 PM because it’s the time when I’m already taking a break from the day. This is also perfect for me because whatever I will learn from the course, I can immediately apply in the next morning. 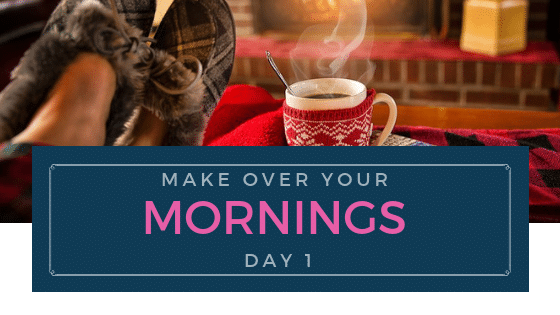 Another task at Day 1 is to tell someone that you are making over your mornings. I decided to open it up to you, my readers and subscribers. I’m making over my mornings, starting today! And I’m going to let you take a peek on it, by writing about it – what I’m learning, what I’m starting to do and what I’m changing in my mornings. Now why did I decide to share it with you here? Because I know that many of you are also hoping to transform your mornings into more purposeful ones. After all, who doesn’t want to wake up excited? How would you feel if your days are productive and stress-free? It’s possible. I have no doubt about it! Why am I this confident? One is because I have the best course to guide me. More importantly, I’m committed to do whatever I find in Make Over Your Mornings. And I’m here to encourage you, and tell you that, if I can do it, so can you. By the way, here’s the link to Day 2! I’ll be adding a post each day as I go through the course. I’ll be linking Day 3 here too, so PIN this post so that it’s easy for you to go back to it. Then just click the link for Day 3.